Below are the words of a refrain to a song that was popular in the latter part of the last century; but, like many songs, the lyrics sing a truth that is timeless. The verses of the song tell about a young man’s dilemma in trying to decide whether to pursue either a certain young lady or to make a move towards her older sister; the refrain, however, carries a wider application for us all. To pick up on one and let the other one slide? It’s not often easy; it’s not often kind. Some folks proudly tell me they won’t make a decision about anything until all the facts are in, that this is the only rational way to live, and any less empirical approach to life simply would be empty-headed. An empiric is one who thinks that practical experience based on tangible or observable experience is the sole source of knowledge and is a person who would have little patience with those who hold a more deductive worldview. The political campaign season has just come to an end, and I wonder if those empirical people voted. I suppose they did, but I question how they could have voted for people they very probably have never met or talked with. All the facts about the candidates could not have been known. It cannot be predicted with a high degree of certainty how a given candidate will behave once in office — promises made are not necessarily promises kept, spin doctors have been busy all during the campaigns and even televised sound bites were not unrehearsed. It seems to me that the empiricists among us, along with the voters who do not insist upon first-hand experience, after informing themselves as best they can, ultimately must rely upon hearsay evidence as they casts their ballots. They must weigh the testimony of others as they read the Voters’ Pamphlet. Haven’t they let a degree of faith — the non-observable and the non-tangible — seep into their individual decision-making process? A great many decisions, it seems to me, are necessarily made before all the facts are known. Consider how we choose our spouses, doctors, employees and colleges. We date likely marriage candidates before making or accepting a proposal, but all our questions about our intended cannot possibly be answered before we walk down the aisle. We talk to trusted friends about their doctors and the treatment they have received at their hands and hope we fare as well. We read job applications and make hiring decisions. We pore over college brochures and mail in our registrations checks. How many of these decisions are made more with faith than with fact? If we waited until are the facts are known and until the jury is back in, wouldn’t we be frozen into inactivity? There is too much of life to live for us to let that happen. There is too much work to be done in God’s kingdom for us to sit on our hands or our votes or our checkbooks until all the risk factors are removed, until all the unknowns are quantified. I wonder if it would be wiser, as we make our individual and corporate decisions, to remember what kind of people we are. We are Christians, people of love, people of faith, people called to action. Let us unashamedly acknowledge the role faith plays in our decision-making process by being compassionate, generous and active stewards in the many aspects of our lives — even and perhaps especially when all the facts are not yet known. The message is thought-provoking and points out many truths. Even though I pray and I listen and I consider known facts, ultimately my feelings win out. Facts are necessary but too many times facts can end up being confusing. Life is an adventure and our faith can give us courage to give whatever we can of ourselves and our resources to make this a better world for our families and those in need of our caring and help. 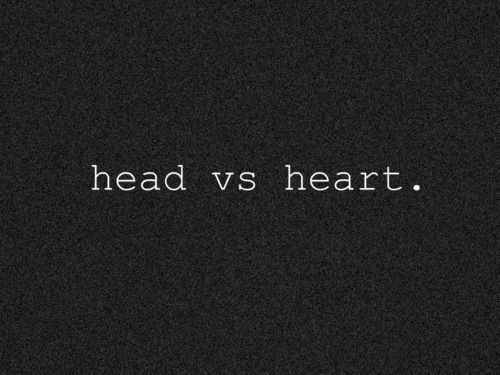 As I read this reflection “head vs heart” it defines what I believe about teaching. In my work in Teacher Education at UPS for mahy years my personal motto has always been posted and repeatedly published in my syllabi: “At the Heart of Teaching is Teaching with Heart”. This motto stems from my faith as it is put into action. A teacher enters a classroom of students; Faith, Action and Knowledge intertwine as one seeks to lead and educate any and all peoples for the future. In my opinion Heart reflects love and faith. It comes first. Sally Ann, Thank you for writing this piece.